Chips are in the bags for Day 1b of HPT The Meadows $1,100 Main Event, and local player Jimmy Stevens (lead photo) managed to edge out Dan Wagner for the chip lead when the dust settled and 20 players headed for the exits with hopes of running it up on Sunday. Stevens finished with 367,000 and Wagner 343,000, though neither player quite matched the 387,500 notched by Day 1a leader Jason Pickup. Ninety-five entries were logged on the second of three starting days, a solid bump over the 53 that populated the lower floor of The Meadows on Day 1a. Another notable bagging was WSOP bracelet winner Joe Ebanks. He finished with a decent stack of 185,000, which ranked fifth. Sporting over $3.2 million in cashes, Ebanks certainly appears well-positioned to compete for the biggest chunk of the $250,000 guaranteed prize pool. Chris Bibb (172,500), Ricky Ali (149,000), Dean Schultz (105,000) and Henry Zou (69,000) also made it through to Sunday's Day 2. Schultz completed a remarkable comeback to get in the bag. He shoved all in with ace-queen when he had around 20 blinds at 1,200/2,400/2,400. He ran into the kings held by Bill Reilly and grabbed his backpack after it looked like he was out the door when the board bricked out. When stacks were counted down though, he had 800 left. Despite being under a single small blind, Schultz managed to pull the "chip and a chair" act. A few hands later, he had almost 10,000 again and picked up pocket jacks. He got his stack in three ways and survived, finding himself with 15 big blinds and a fighting chance on which he made good. 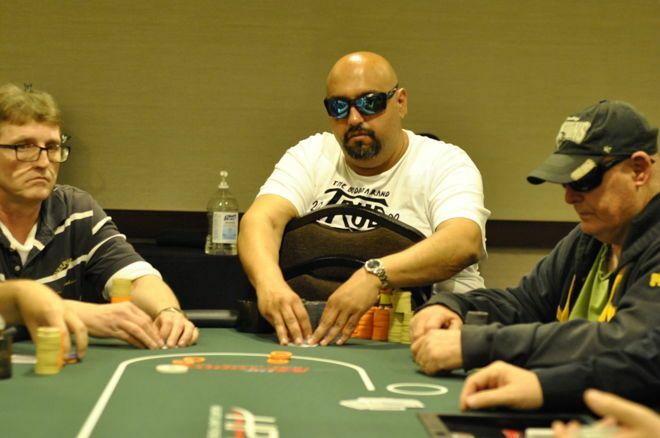 A few more notables showed up on Day 1b but most found themselves dry on chips. Nick Pupillo, Adam Friedman, Andy Rubinberg, Iverson Cotton Snuffer, Andy Spears and DJ MacKinnon were among the busted and all will still have one last shot on Saturday's Day 1c. Day 1c commences at noon local time with another 15 levels on tap. Come back to PokerNews for more HPT The Meadows live updates at that time.